TRAITOR’S GATE were one of those NWOBHM bands that got around back in the day. Touring with the likes of SAXON, MARILLION, and ANGELWITCH back in the 80s, as well as supporting their local scene by headlining their own gigs, they developed quite a loyal fanbase. Sometime after ’89, they went into hibernation and stayed there for over twenty years. They devoted time to raising their families, worked at jobs, their days of music a fond yet distant memory. Then in 2017 they were invited to get back onstage for One Last Job at UK’s Brofest. Deciding that TRAITOR’S GATE wasn’t ready to go to sleep forever just yet they decided to keep things going, and after many many years, they finally released their debut album “Fallen” this year. After all these years, Guitarist and band founder Andy d’Urso lamented in an interview at Metal Brothers that he wished he’d gotten into the NWOBHM scene sooner, as it would’ve meant more gigs. He would’ve also like for the internet to be invented a decade earlier as he loves the freedom and the ability to be noticed quicker by the right people than back in his day. From the first song, it’s immediately apparent that TRAITOR’S GATE hasn’t aged a day since the 80s. “Retribution” blazes in on a flaming steed with Andy d’Urso proving he cans still shred guitar chords like he did on the first EP, “Devil Takes the High Road”. While tracks like “Homeland” and “Deceiver” err closer to Power Metal, if you want a real taste of NWOBHM, that would be “Mean Streets” and “Edge of Destruction”. 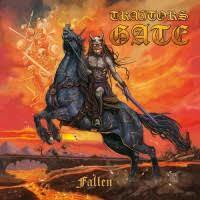 TRAITOR’S GATE has never sounded better, bringing us back to Heavy Metal’s earlier days. They are already planning their sophomore release, so thankfully they aren’t going back to sleep anytime soon.